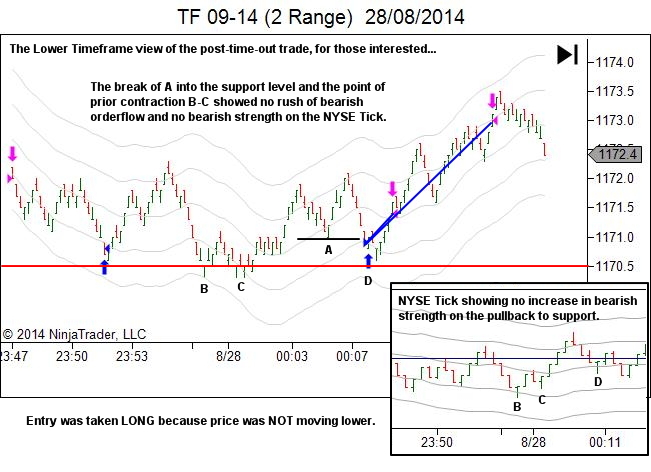 The YTC Price Action Trader contains what I call AA Statements (you'll need the ebook series to know what that means). They're slightly modified as well for the lower YTC Scalper timeframes. But essentially they're a list of short dot-point procedures relevant to various stages of the trading process. 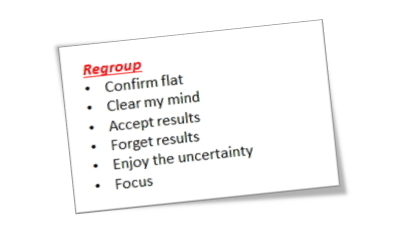 First up is the Regroup procedure. Most important, before stepping away from the screen, is confirming that I have NO open position and NO pending orders sitting in the market. Totally flat! No risk! Then it's time to get out of the room and clear the mind. I find a quick burst of aerobic activity really helps here. Maybe punch a bag or pillow or something else soft! Whatever works for you. Just get rid of that negative energy. This is time for my breathing exercises. One minute! Five minutes! Ten minutes! Whatever you need to get to a relaxed and calm state. Accept results! A big part of this is "thanking" the losses for their lesson. It's amazing the edge that this takes off any remaining negative emotion. Forget the results… put them in the past. Enjoy the uncertainty… affirm your love for the challenge that trading provides. 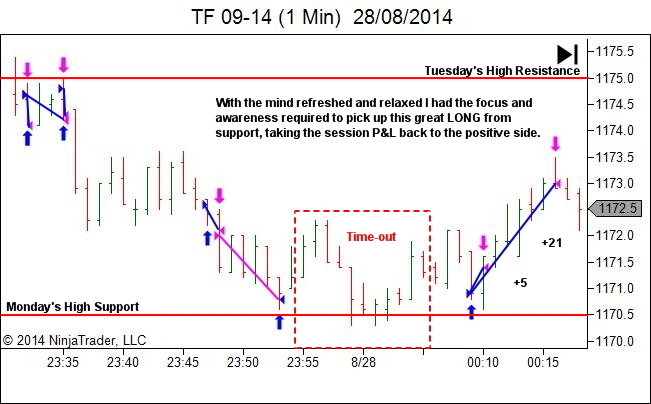 And then head back into the trading room with a clear and focused mind. Back at the trading desk it's time for a quick "Focus" before trading. This is quite simply a repetition of these phrases, to ensure a relaxed body and mind. 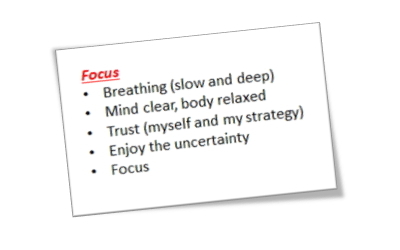 The last one, "Focus", being the trigger that takes my attention back to the screen. 1. 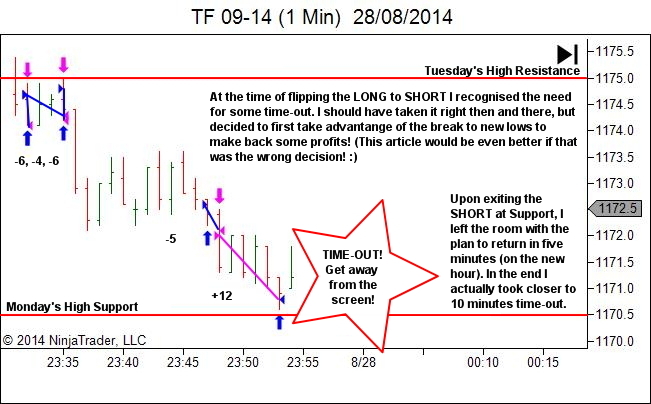 Note the importance of the concept of keeping your average loss SMALLER than your average win! 2. Note that entry of the LONG from support was using the same concept discussed in the numerous articles over the last six months – entering LONG because price couldn't move lower. 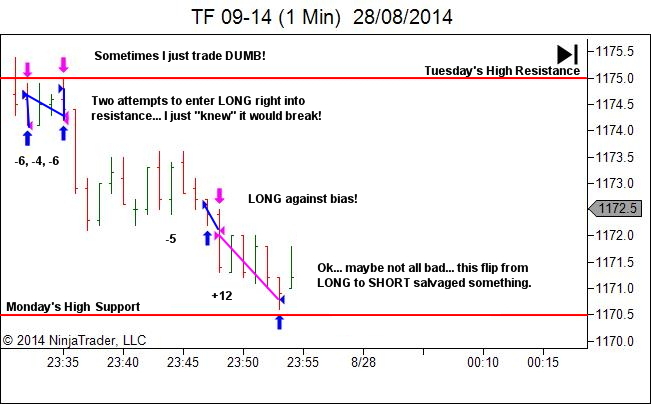 Good article – I think it is impossible to learn to trade regardless of timeframe without frustration. For me, the more time and effort I spend the more frustrated I can get when things don’t work out. Luckily, I am normally frustrated at my own mistakes (lack of discipline) as opposed to blaming the market. Big message here for me: get over it quicker! At the moment I have to quit trading for the day, and even the next day I can be a bit on tilt. This article makes me realise I must accept mistakes, learn from them, get calm and re-group – preferably in less than a day! Thanks, Lance. I think you’re exactly right. Much of the frustration comes from expecting perfection – something that can never happen in an uncertain market environment. We will make mistakes. We will underperform what was potentially available (and what appears so obvious with hindsight). So instead of trying to be perfect we need to learn to accept our imperfection. Forgive ourselves. And work on strategies to “get over it” as quickly as possible. If that takes a couple of days right now… so be it. Nice Long, the break into further suport was also on weakness (price needed 2 bearish candles on the way down in contrast to 1 bullish candle on the way up).